Explanation: The strange-looking rock formations in the foreground of this skyscape are called hoodoos. Towers of weathered, eroded sedimentary rock, hoodoos are found in arid regions of planet Earth and are particularly abundant in an area known as Bryce Canyon National Park in southern Utah, USA. The more familiar night sky pictured here was recorded early Monday morning and includes bright star Capella, alpha star of the constellation Auriga, left of center. On the far right, a very over exposed crescent Moon dominates the sky in close conjunction with the sister stars of the Pleiades cluster. 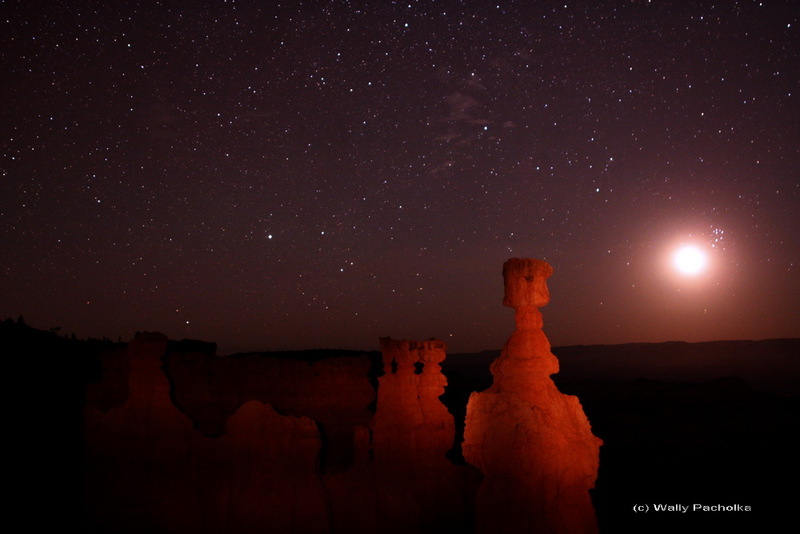 The curious shapes of the two tall, illuminated hoodoos suggest their popular monikers; Thor's Hammer (right) and The Temple of Osiris.